LOOK HERE features the work of three artists who harness the power of observation to examine the impact of humans on the climate and environment. Through video, photography, appropriation, multimedia installations, sculpture, and paintings, these artists draw upon the histories of both scientific inquiry and art to make contemporary investigations about the environment today. The work considers how observation in its many forms can facilitate deeper perspectives on human-environment relationships, and underscores the importance of observation to scientific understanding, as well as artistic endeavors. In “Scenic Kiosks,” William Van Beckum creates images by appropriating photographs posted to Instagram by hikers. 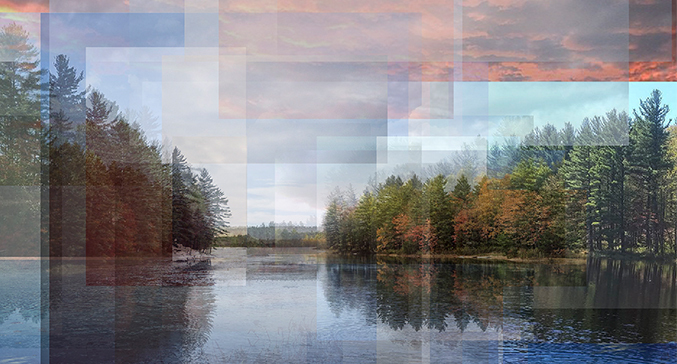 Each piece is made up of 20 to 50 images from a section of the New England Scenic Trail, creating a visualized record of the communities’ involvement with the trail. Isabel Beavers creates installations using digital animation, drawing, sculpture, and light to visualize scientific concepts and knowledge related to ecological systems. In “The Problems and Possibilities of Seeing and Knowing,” Allison Gray tracks down fruit that has been endangered due to industrial farming practices. She then creates sculptures by preserving the fruit species in resin. Finally, oil paintings of the preserved fruit are completed from observation.